Florida State (1 to 4 non-home wins over top 50) – The Seminoles won 37-31 at a neutral site against #37 Oklahoma State, but they could have up to three more top 50 wins away from home at #28 Louisville, #31 Miami, and, in the ACC title game, against #32 Duke. That’s still no Top 25 road games, so even one loss should drop them out of the playoff. Notre Dame (0 to 2 such wins) – The Irish initial No. 10 ranking is probably accurate because they don’t have a top-50 road win yet. However, they do have the most impressive road loss at the top non-SEC team (27-31 to #5 Florida State), and if they get two top-50 wins away from home against #25 USC and #13 Arizona State they should be in the playoffs. This order is where the teams are in the pecking order if they don’t win out–not necessarily right now before they have faced some of their road tests. If Arizona State or USC beats Notre Dame at home, then the Pac-12 champ should be in provided they still have only one loss, as all already have one win away from home against a Top 50 team. Oregon (1 to 3 such wins) – The Ducks won at #22 UCLA 42-20 and could add such wins at #24 Utah and in the Pac-12 title game, but really Notre Dame should leapfrog them in a close call if both win out. Arizona State (2 to 4 such wins) – As the only non-SEC team with two such wins (38-34 at #25 USC and 24-10 at #40 Washington), ASU, if they beat Notre Dame at home and win at Arizona and in the Pac-12 title game, needs to be selected with four wins away from home over top 50 teams – but right now they are behind Oregon. Arizona (1 to 4 such wins) – The huge 31-24 win at Oregon puts them on the map with three more road opportunities at UCLA, Utah, and in the Pac-12 championship. Utah (1 to 4 such wins) – With the huge 30-28 win at UCLA, the Utes could make it with wins at #13 Arizona State, at #26 Stanford, and in the Pac-12 championship. It’s been only five years since Utah blitzed Alabama 21-0 in the first quarter to win the Sugar Bowl. While the Big 12 has been the second best conference to the SEC, K-State is probably the only team that has a reasonable chance to make the playoffs based on this criteria, as the best TCU or Baylor could end up with is one road win against a Top 50 team. 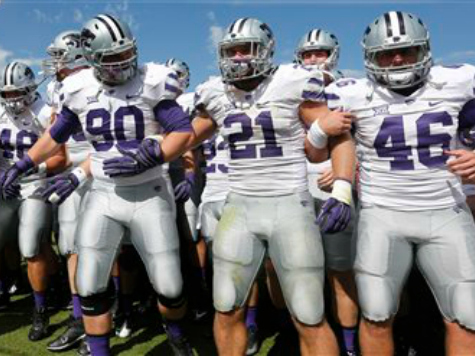 K-State (1 to 4 wins) – The Jayhawks are the one Big 12 contender that already has the 31-30 win at over #12 Oklahoma, and if they can win at #10 TCU, #19 West Virginia and #14 Baylor they could leap frog into the playoffs. They are held back by being the only ranked team to lose a home non-conference game (Auburn) which probably means they still need the teams in front to all have two losses. TCU (0 to 1 such wins) – the Horned Frogs only chance for a road top-50 win would be at West Virginia, and that just doesn’t seem like enough. Baylor (0 to 1 such wins) – The Bears only chance for a road top-50 win is at #12 Oklahoma, which doesn’t seem like enough. Five of the top six teams in the Big Ten lost their only non-conference game to another Power conference, so it seems almost impossible to give them a spot for beating each other. While Michigan State is the top team in the Big Ten right now, it is actually even harder to make a case for them being included if they win out than if Nebraska or even Ohio State do the same. Nebraska (0 to 3 such wins) – While they rank behind Michigan State now, the Cornhuskers would have the best case for a playoff bid if they won out as the only of the top six Big Ten teams with a non-conference win over a Top 50 (41-31 at home over No. 31 Miami). They have no top-50 road wins yet, but if they win at #34 Wisconsin and #45 Iowa, and then were to win the Big Ten title game over #11 Michigan State, to claim they had beaten every team they played (avenging the narrow loss at Michigan State), then you could see a bid with some losses by teams above. Seeing the nation’s top runner in Ameer Abdullah (1,249 yards at 6.9 yards per carry) might be enticing. Ohio State (1 to 4 such wins) – Ohio State did CRUSH #42 Maryland 52-24 on the road, so if they add two more road top-50 wins at #11 Michigan State and #47 Minnesota, and then were to add a win over Nebraska in the Big Ten title game, you could see a scenario with a bunch of other losses above, but getting whipped by a very mediocre Virginia Tech team at home is really tough to overcome. One of the two largest fan/alumni bases (Texas is the other) could tempt the committee. Michigan State (0 to 2 such wins) – Right now they are ahead of Nebraska due to narrowly winning at home, but their only chances for road wins against top-50 teams are against #42 Maryland and in Big Ten title game. Even a title win would come against Nebraska for the second time – or one of three B10 Western teams that lost their only game to another power conference–a Minnesota team destroyed by TCU, a Wisconsin team that lost to LSU, or an Iowa team that lost at home to Iowa State. If Michigan State wins out, their best road win would be against #42 Maryland. Even adding a neutral site win against a Big Ten West champion seems to leave them far short of “playoff worthy” even if a bunch of teams above them lose to tougher competition. East Carolina is the most fun “what if” on the board. East Carolina won at #44 Virginia Tech. If they could have held a lead at #30 South Carolina, and if #28 Louisville had stayed in the American Athletic one more season to give the Pirates a chance at a third Top 50 win away from home in a Conference Championship and an undefeated season, we could have had our first real discussion about a non-Power 5 team making the playoffs. The SEC will sort itself out. Alabama is the only team in the country with three road wins against top 50 teams (#19 West Virginia, #8 LSU and #41 Tennessee), and will be favored against two current playoff teams (Auburn and Mississippi). But between Georgia and the Mississippi and Alabama schools, it is hard to see there not being two SEC schools even if that includes a 2-loss team.